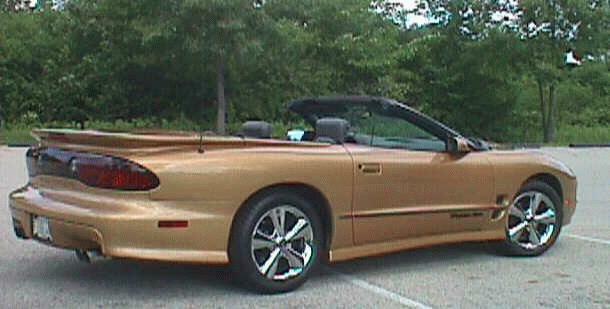 This is a convertible Trans Am equipped with the Ram Air package. 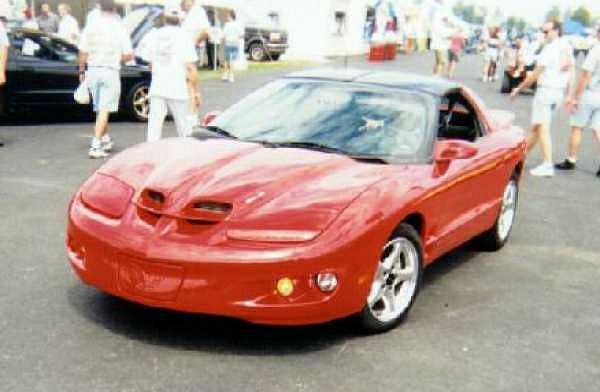 The car made an appearance at the 1997 Trans Am Nationals held in Dayton, Ohio. 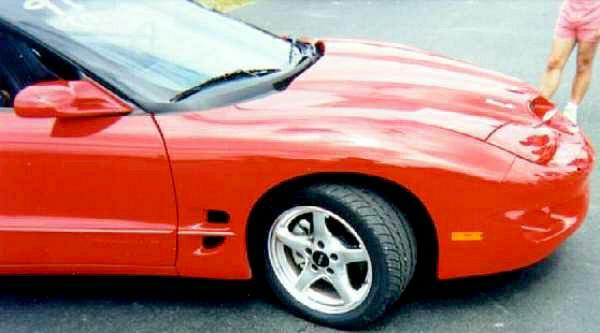 The pics were taken and submitted by Kenny G. The introduction of the ALL new 1998 Trans Am has proven to be an extremely exciting one. 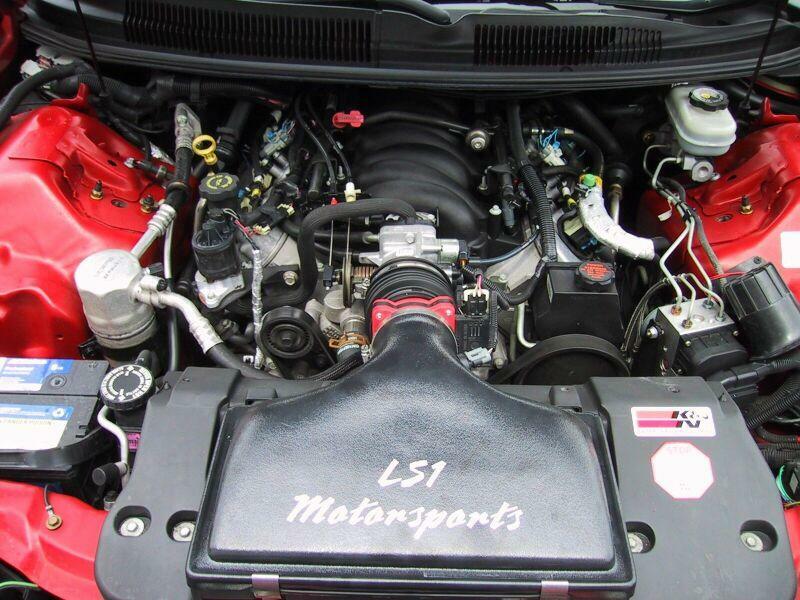 While the outward appearance may not please everyone, the new LS1 engine combined with a host of other upgrades should. The new LS1 is an all aluminum block with cast iron cylinder liners and cast aluminum heads. The 90 degree 5.7L V-8 displaces 346 cubic inches and with a 3.90 bore and a 3.62 stroke the standard horsepower rating is now 305hp @ 5200 rpm with torque figures at 335 lbs.-ft @ 4000rpm. Some other interesting additions to the new block are six bolt mains, hypereutectic pistons, powder metal connecting rods, a nodular iron crankshaft, a coil per cylinder ignition system, and a cast aluminum oil pan. There are a slew of other improvements and new technologies associated with this motor. I hope to provide an illustrated breakdown of the new engine soon. The Ram Air version will come in around 320hp. The new Formula with a Ram Air hood. 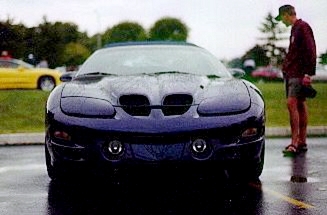 Contrary to many fears the new Birds did not lose their signature Flip-Up headlights. They remained but with a new design. Each housing now holds two "mini-beam" headlights that are supposed to improve lighting during nighttime driving. 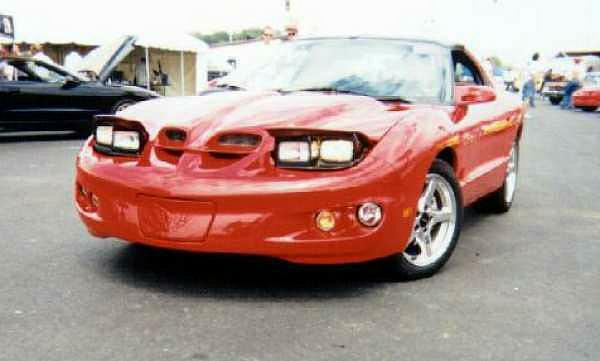 Driving lights are also now standard equipment for Firebirds. Additionally heat extractor ducts are once again installed in the fenders to help with brake cooling. The braking system has also been redesigned. New rotors up front have increased in diameter from 10.7 inches to 11.9 and in the rear from 11.4 to 12 inches. Also installed in the front are aluminum dual-piston calipers and brake linings have been changed from semi-metallic to organic. The Anti-lock Brake System is now a solenoid based system manufactured by Bosch. 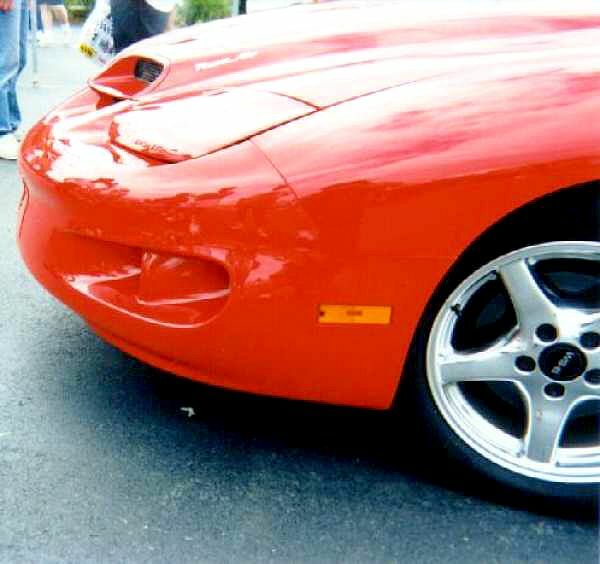 An Electronic Brakeforce Distribution system has also been installed and the Firebird is the first American car to utilize this system. It replaces the standard hydraulic proportioning valves. 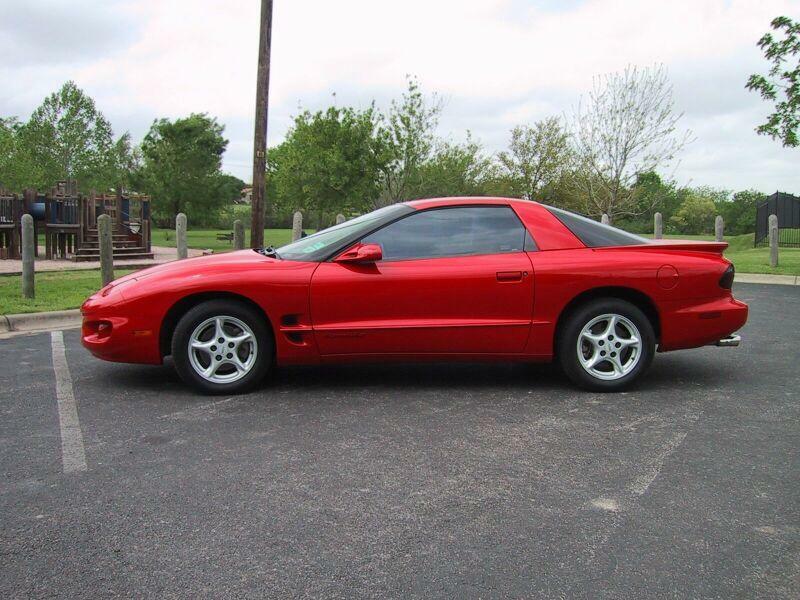 Lastly the new Firebird also gets a revised traction control system that is operator selectable from the interior. Eric's best time to date is 14.050 @ 102.59mph. 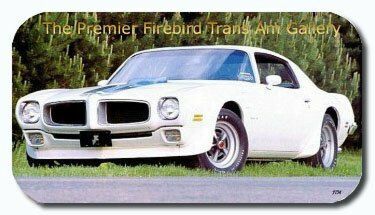 Eric used to own two '78 Trans Ams and you can go by the '78 Firebirds Lot#1 if you'd like to see them. 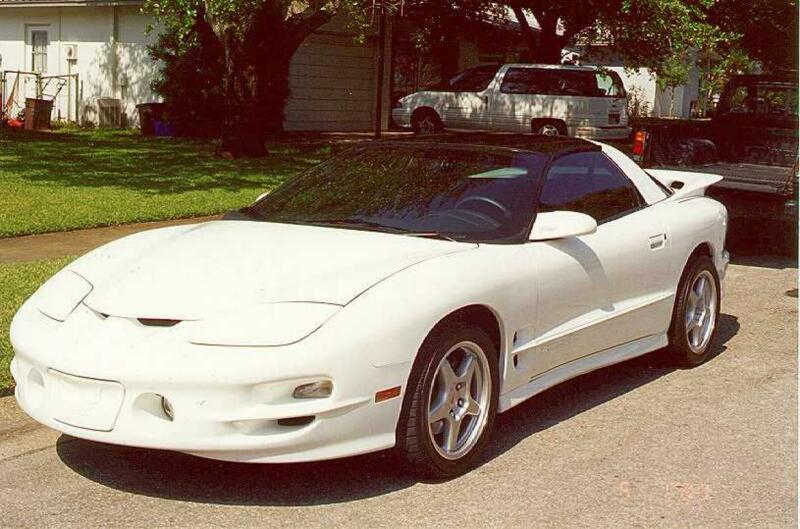 A '95 Trans Am also once graced his driveway. 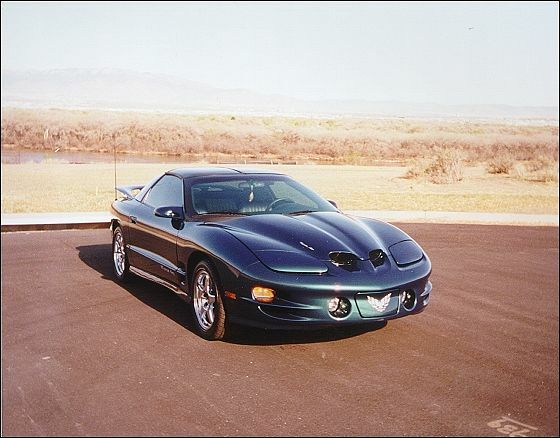 It can be seen at the '95 Firebirds Lot#1. 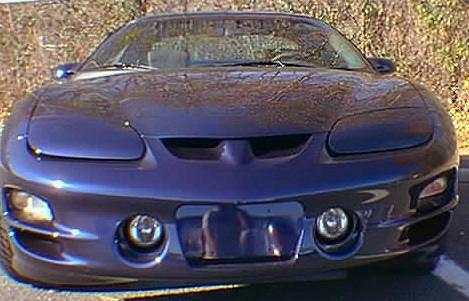 "I considered the Trans Am, but when we lined them up together, I liked the front end of the Formula much better. At the time of purchase, there were only 100+ Formulas in the Great Lakes Area, and only 2 Black Formulas. I suppose it was just nice to be the first on the block with a new toy." 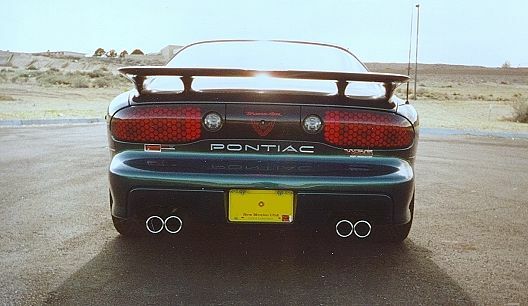 Like most folks Jim has a few mods planned for the new Formula including a Flowmaster Cat Back exhaust system and a K&N intake. 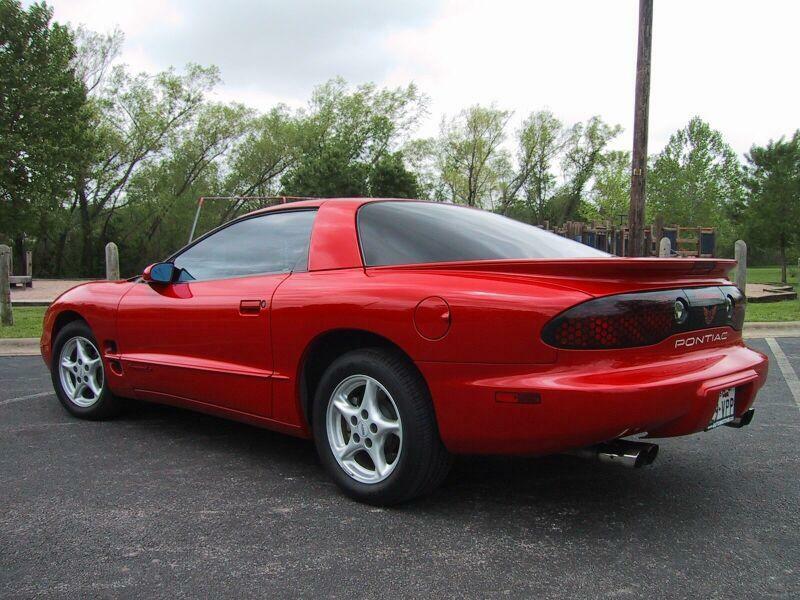 Jim is a true lover of Pontiacs and owned two Firebirds previous to this one. 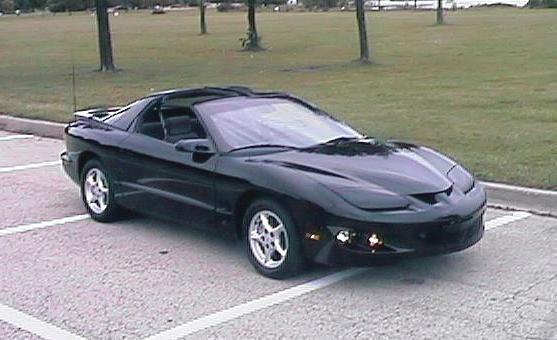 The aforementioned 1995 Firebird (seen at the '95 Firebirds Lot#2). Jim has already performed a few modifications to the car and more are in store. 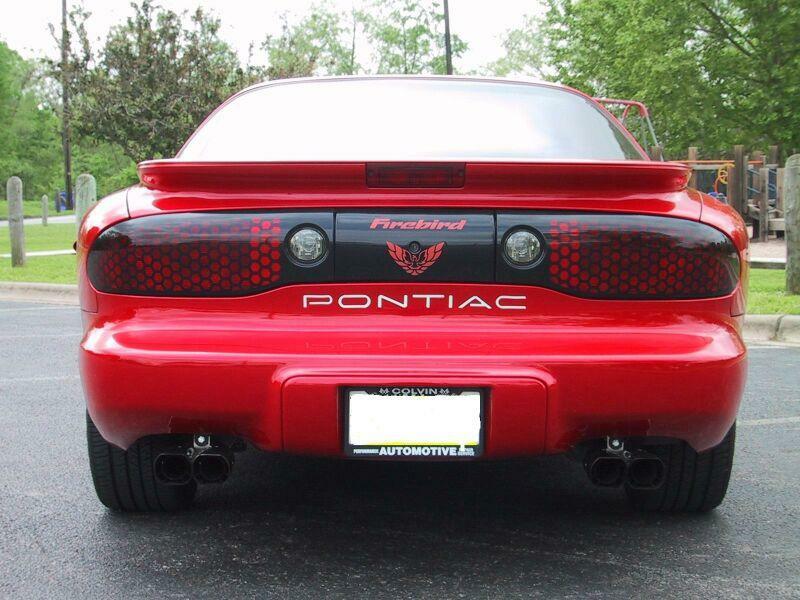 A K&N Filter has been installed for improved airflow as well as a Borla Dual Cat Back exhaust system. 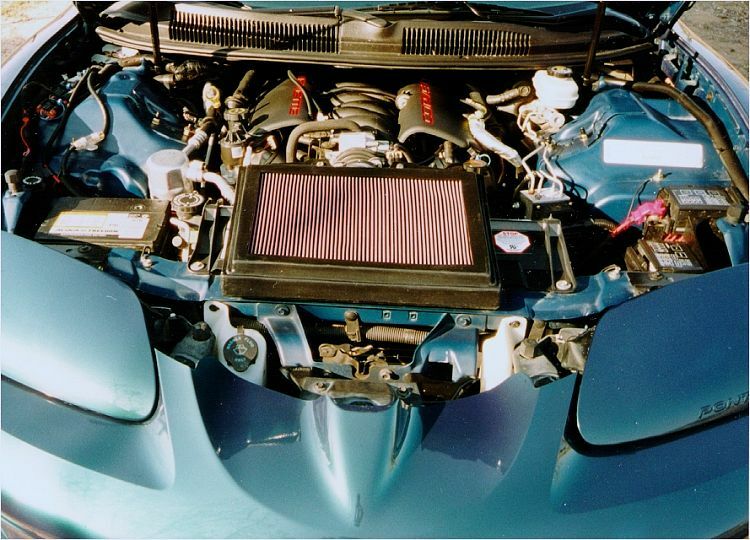 Jim is currently researching the addition of the Suncoast Creations Ram Air hood with a functional box or a custom intake system. Also the addition of a 160 degree thermostat is planned and he'd even like to make the two openings in the nose underneath the running lights functional. Jim is the webmaster for the site www.FBody.com. 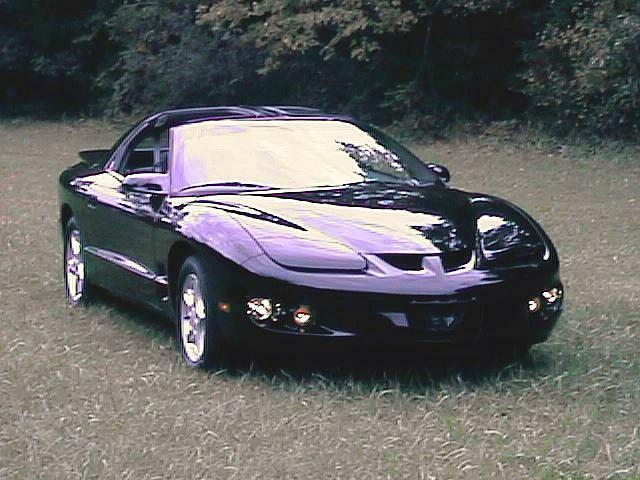 He also webmasters his own personal homepage called Jim Hogan's 1998 Trans Am Page. You can click on these link to visit either of them. "They didn't make any. But what is this Vin # 000008 I found in a parking lot. I asked them about it and they said I must have seen the Vortec SC one. But no, it wasn't that one. 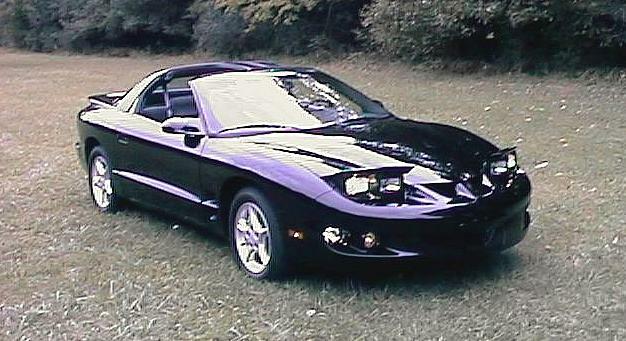 It was a WS-6 Ram Air Conv't with a Black top and Taupe interior (odd combo, I thought), and marked as such with Pontiac Dealer plates. I went back and it had dissapeared. I did take a bunch of pics when I saw it the 1st time, LOL. 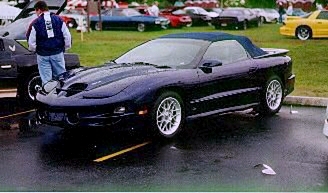 They said anything I saw there was ok for people to see..."
Bob owns his own 1998 Trans Am seen at '98 Firebirds Lot#2. 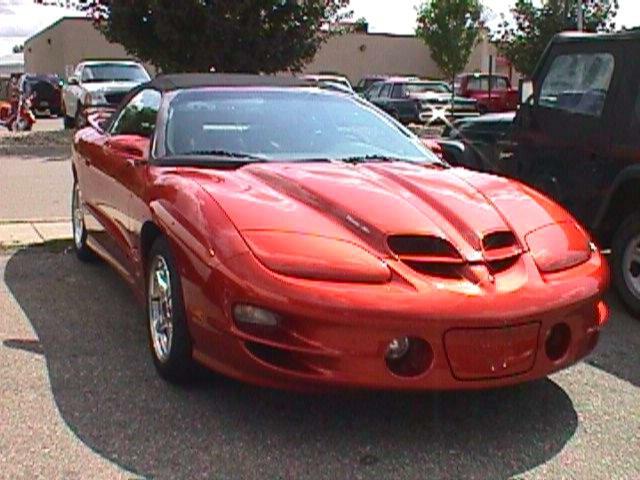 The Trans Am is also optioned with the highly desirable 6-speed manual transmission and now sports a 345hp rating. 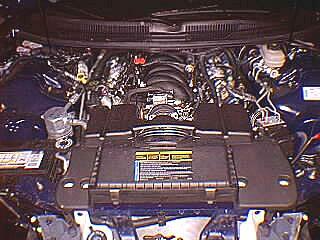 Mekko recently installed a new turbocharger system, and the car now runs 11.6's. 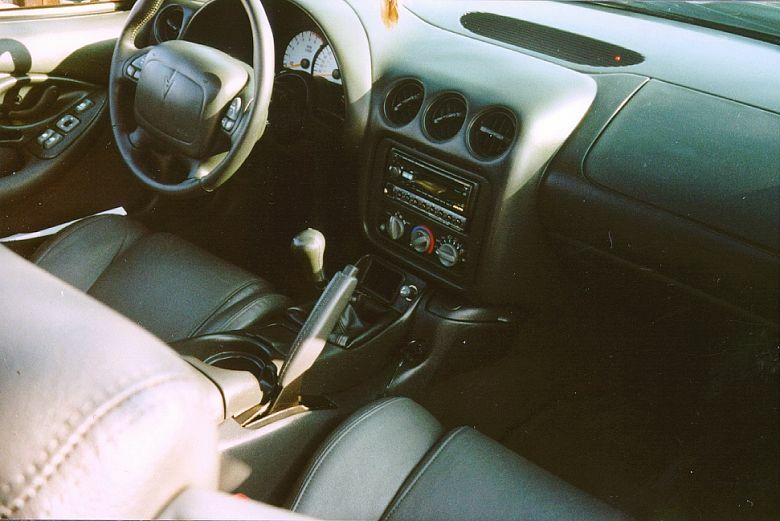 "It has all free-mods, homemade free flowing air lid and ram air. Hollow logs (modified stock exhaust manifolds), off-road y-pipe, 3" back to a Dynomax Bullit muffler. Nitrous (85 dry shot right now). 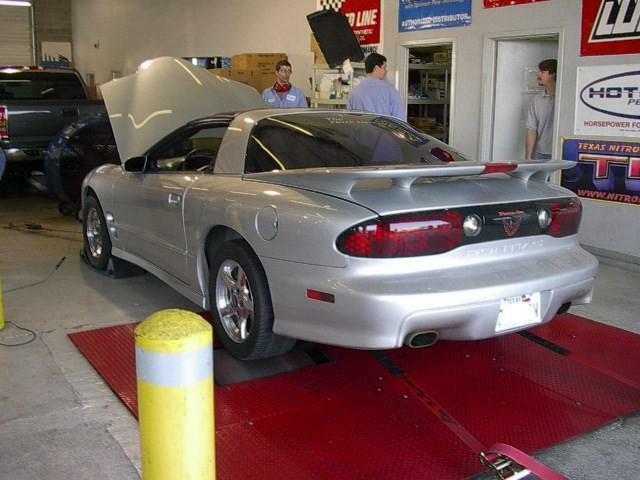 It pulled 292 rwhp and 348 ft-lbs torque, at the time of the dyno I had a 3200 Vigilante stall, the stall ate up too much HP. I was no where near impressed with its performance so I reinstalled the factory stall for the time being. 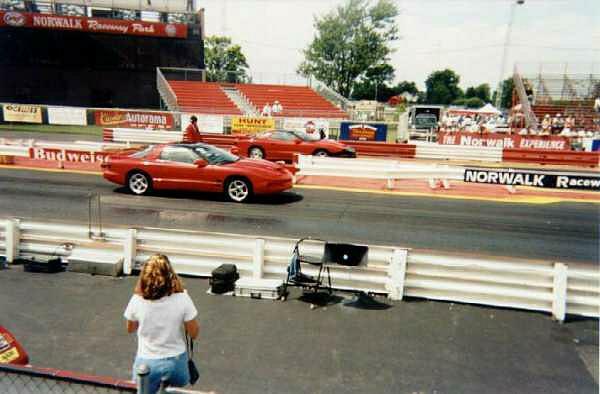 My last time at the track (spring 2002) it pulled a 12.2 @ 109 with a 50 shot of NOS. Right now its just a ride back and forth to college and work. Nothing much special." 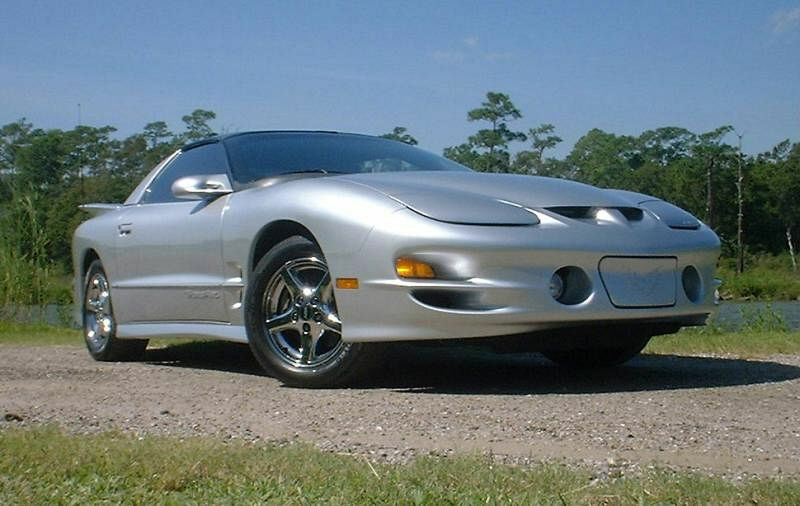 "After owning an '87 Trans Am, I finally decided to sell her back in Dec of '00. Of course my new plan was to purchase a newer bird. Because the expense of owning a new bird was a bit too expensive for me, I had to find a good deal. 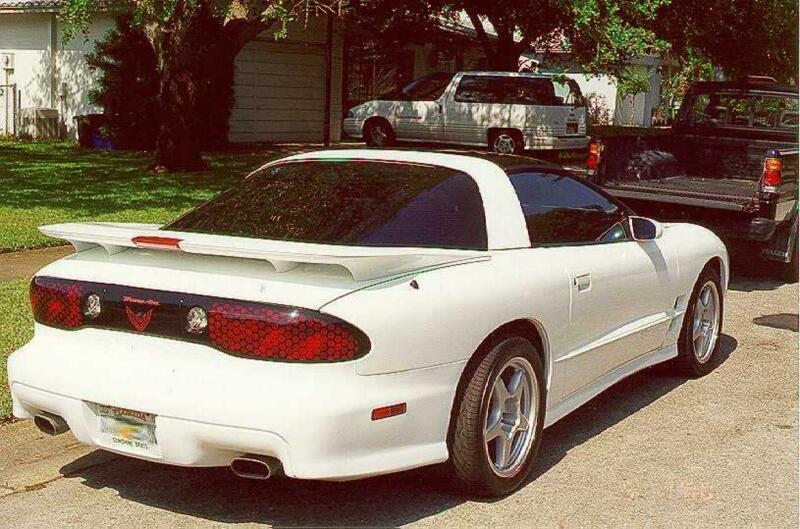 I really wanted the Trans Am, but the budget I had would only allow me to purchase a 93-97 equipped with an LT1. 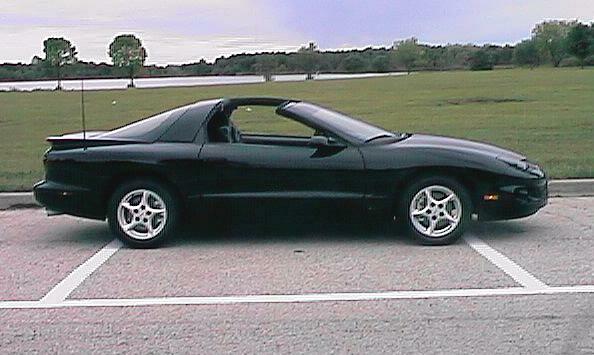 Don't get me wrong, that's a powerful machine, But I really had my mind set on the LS1 and the newer body style. So before I went and jumped on a deal, I decided to look some more. Sure enough my waiting paid off. The vehicle wasn't the TA but was a Formula that had the motor I wanted and it was at the right price so I jumped on it. I purchased the bone stock '98 with 35,000 miles on it in Feb.'01. Since then I have added some mods and I'm extremely happy with it." "Its customized, but tactful. 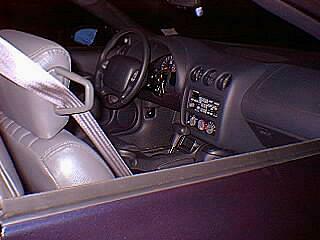 It was a GM Executive car. I tried to order a Gold/Black Convt., but the color was discontinued on me. 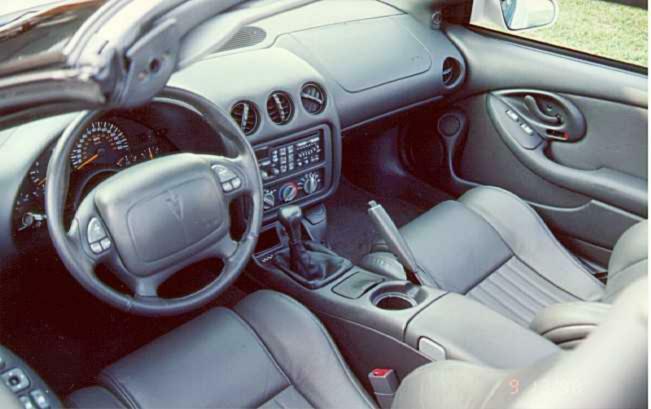 Letters, faxes and emails to Pontiac were of no use (I wanted a stick shift, too). 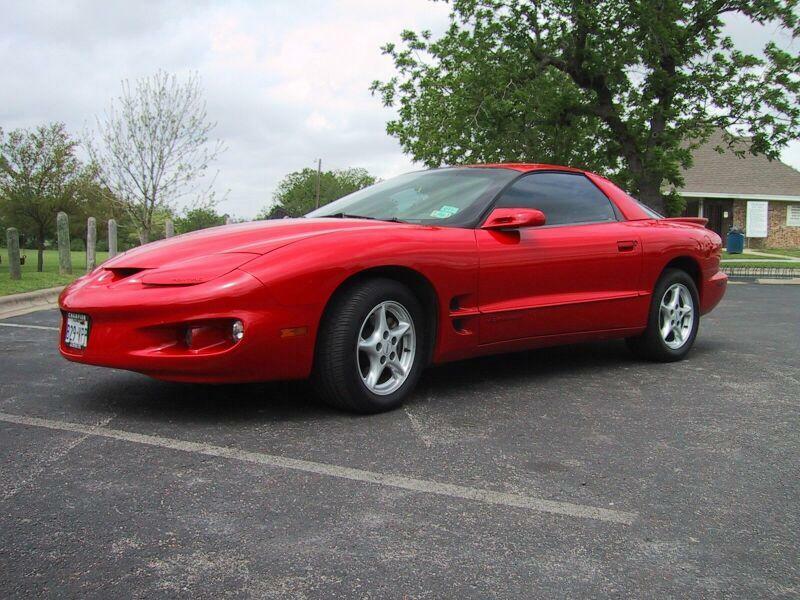 I ended up getting a '99 Red/Tan V-6 Convt. with a 5 spd. 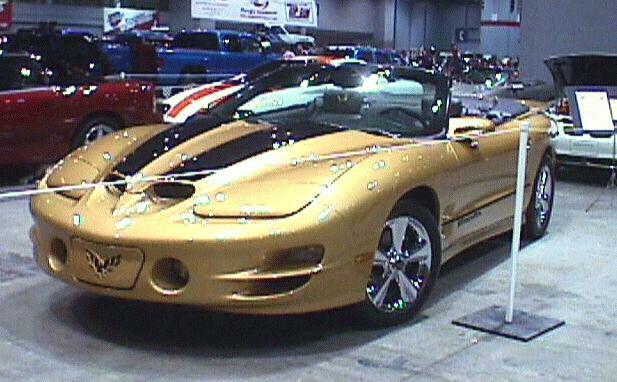 Six months later the Gold/Black T/A Convt just appeared on a lot near me, by luck I guess and I traded the '99 V-6 for it. 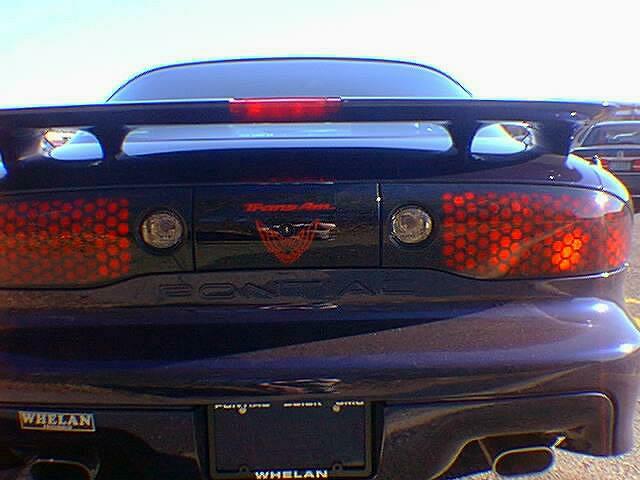 Most of the custom parts were off my V-6. I do have pics of it in its original condition as well (Actually, I kept all the parts, too). It won 3rd place at the Rt 66 POCI show for 67-99 modifieds. 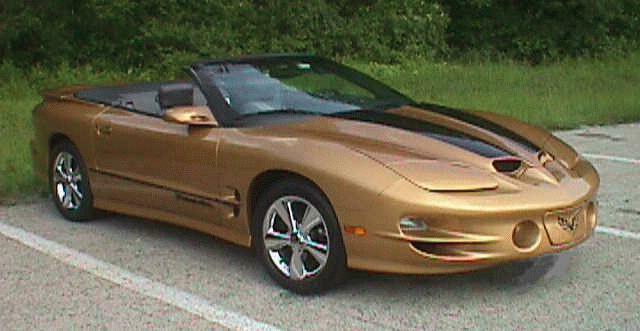 There were only 17 Sport Gold Metallic T/A Convt's built. The wheels are REAL and modified (by me) Cragar SS/980's in Chrome. They are 17 x 8 up front with 255/45/17 Michelin Pilots and 17 x 9 in back with 285/40/17 Michelin Pilots. The caps are modified '87 or '88 GTA Medallions in Black/Gold. If you look at my V6 site, there is a whole page with a voting booth of the test caps I created in the process of modifying them. 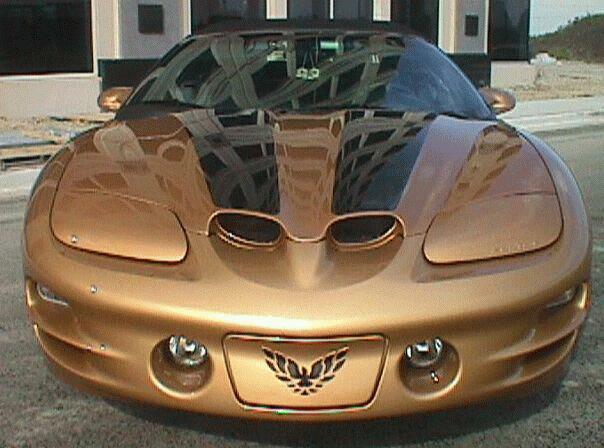 The Black/Gold Firebirds won the Vote, and look even better on the Gold/Black Convt. You should see them flash at about 5 mph! Its like having 17" strobe lights mounted down there. 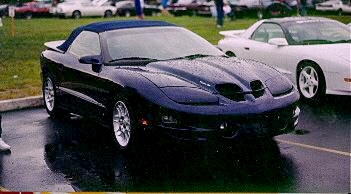 :)"
Bob's Trans Am recently won 1st Place for Contemporary Convertible at Chicago's World of Wheels.